Sussex is set to be hit by a heatwave as temperatures could exceed 30degC from mid-week. The Met Office says that tomorrow (Saturday) and Sunday morning will start cool and fresh, but temperatures will soon rise into the low to mid 20s for many across the country. By the time we get to Monday, temperatures nationwide will be in the low to mid 20s, with a few spots into the high 20s, and are set to rise even further from mid-week. Chief Meteorologist, Frank Saunders said: “As warmer air from the continent moves towards the UK from Wednesday, temperatures will climb into the mid to high 20s quite widely. By this stage, some places in England and Wales will very likely top 30 Celsius – it’s not unlikely somewhere could reach 32 Celsius. UV levels will be high or very high during this warm and sunny spell, so people should take care when outside enjoying the weather. Dr Owen Landeg, of Public Health England, said: “Much of the advice on beating the heat is common sense and many people will want to enjoy the long spell of warm weather in the forecast. “Now is a really good time to think about what you can do to protect you and your family and friends’ health during summer. 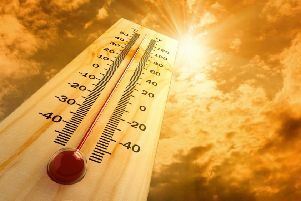 “For some people, such as older people, those with underlying health conditions and those with young children, the summer heat can bring real health risks. That’s why we’re urging everyone to keep an eye on those you know who may be at risk this summer. The highest temperature recorded in the UK so far this year is 29.1 Celsius at St James Park on 19th April. The UK June temperature record is 35.6 Celsius, recorded at Camden Square on 29 June 1957 and Southampton on 28 June 1976. So how long will this warm, hot weather last?